In Memoriam : Thomas Howard McGuire, Jr. The City of Oaks Foundation mourns the sudden loss of our friend and Trustee, Thomas Howard McGuire, Jr. who passed away suddenly on Tuesday, September 4, 2018. Tom was in Saint-Jean-Pied-de-Port, France hiking the Camino de Santiago, a longtime dream of his, when he passed away. His family reports that his final days were filled with adventure and joy. Tom had over 35 years' experience in the nonprofit and philanthropic sector and had served as CEO of two statewide organizations and a major regional foundation. Tom was a recipient of the City of Raleigh's 2003 Medal of Arts Award. He gave back to the community throughout his career with his own charitable giving and service to other civic and community organizations in Raleigh as a board member, officer, board chair, and volunteer. 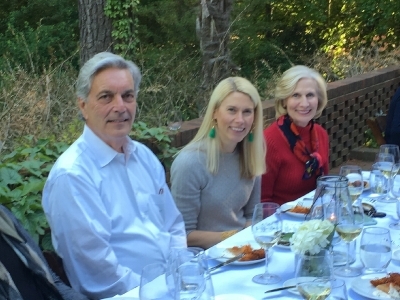 Tom had joined the City of Oaks Foundation as a Trustee earlier in 2018 after years of having been a wonderful neighbor of the Foundation’s Joslin Garden. He was an active member of the fundraising committee, an inspired advocate for the Foundation’s work and a caring steward of the Joslin Garden and the West Lake Drive neighborhood. Tom maintained his own beautiful garden and kept bees that contributed to the health of neighborhood’s flora. We will miss his vision, experience, and extraordinary generosity and kindness toward others. Pictured: Tom with his wife Barbara Hunter McGuire and daughter Martha Sickles Sanders, during a spring event at Joslin Garden. A celebration of Tom's life will be held at Holy Trinity Anglican Church in Raleigh on Saturday, September 15, 2018 at 11 o'clock in the morning.